We have been busy learning loads about the medical centre and the opticians. 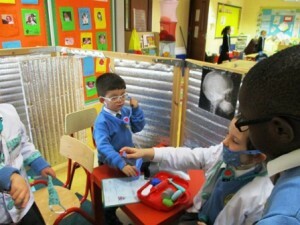 We loved playing the nurse, the doctor, the patient, the optician and the receptionist. We made patterned glasses and doctors tools. We have been testing each others eyes and prescribing medicine for sick patients. We have been practising the phrases “I need to get my eyes tested.” and “Where is the pain?”. We know lots of different body parts and soon we are going to be learning all about the 5 senses. Have a look at some of our photos here.